Hey Neal....Looks great! We had a little road rash from our Alaska trip on one of our bins as well. I ordered the entire package from Summit while at the Newmar International Rally in Sedalia. We had them ship to us the first week in November when we landed in a place for more than a few days. One of the pieces was too long by 4 inches so we delayed our install until this week when we got the replacement piece. Summit was great and easy to deal with. The install is a couple of days (20+/- man hours total) with me and the DW taking our time. We should finish it today and I will post pictures when all done. In addition to the bins, we did the steps, kick plate and wheel trim. All in with shipping we were right at about $2,500. It really dresses up the coach. All finished except for a little clean up of excess silicone caulking once it completely dries. I highly recommend the Summit Stainless Steel. It really dresses up the coach and the staff that we worked with are great. Sorry I did not get a better picture but the sun was setting right behind the coach. Neal, stop by Summit in Altoona, IA and they will custom make pieces for your coach while you are there and install them if you want. You do need to call ahead to schedule. When we bought our used Allure, my DW saw an American Coach with the Summit stainless trim. She commented how nice it looked. When I inquired with the dealer about the price (they quoted $3,000 for my coach), I told the DW it was too expensive. Her response was, see what it will cost if you install it yourself. So, I had Summit make the trim, ship it to me in VA, and I installed it over a weekend. It wasn't hard but time consuming to do it right. I also did the steps and the kick plate below the entry door. No regrets. My cost was about $1,600. On the way out West on a trip later that year, we stopped by Summit and had them measure and make more trim for my side radiator grill and a piece for the lower front of the coach. They shipped it to me in Idaho and I installed those pieces while in an RV park. The stuff is primarily bling but really dresses up a coach and does provide some protection. And easier to fix by just replacing the SS trim vs a door repair which is not cheap. My first camping trip two doors damaged. Fortunately below the 8 inch coverage of the SS measured from bottom edge up. Yes it can be dented and, since it is mirror polished stainless, it does show small scratches. I have a small ding in one of my pieces and if you let the light hit it just right, you can see fine scratches in the finish. However, when you polish it up with a good metal polish, it looks really sharp. As far as removing it once it is installed, that is not easy for sure. It is held on with 3M VHB tape and Sika Flex adhesive caulk. One of my original pieces had some dings from the factory (could not see them before I installed it) and Summit removed and replaced it while we were at their factory. I watched the guys remove that piece and it was not an easy task to get it off the door. Here's a pic of my former LADB that I took in June of '07 when in Davenport, IA at Summit's original location. This was just as Summit was coming on board. 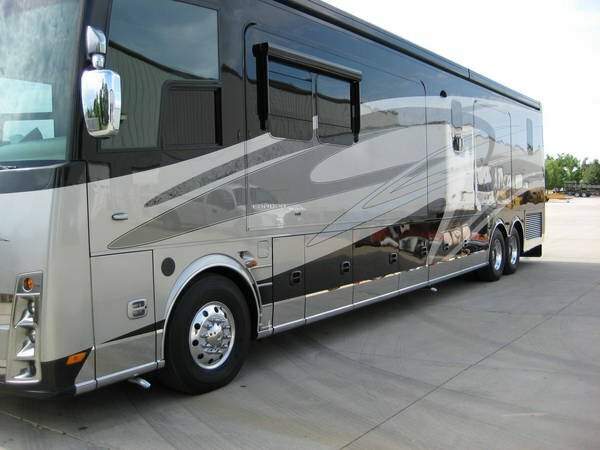 As Gary and others will certainly attest, they're an awesome company to work with aftermarket and the fact that you now can have the work done on your new coach at the factory is a bonus. I'm going to wait till the end of this season here in Fort Myers, as we will be joined here in January by "Amigo Chuck" with his one or two year old Essex.... I'm hoping that I escape the "honey I really love their new Essex" with still owning the Renegade.